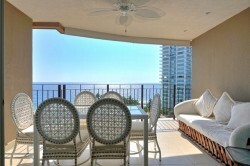 This Beautiful 3 Levels House is located in the heart of Marina Vallarta. Across the street from the golf course 5 more..
House Ikal, located in Nuevo Vallarta Area, the most propular zone in Bahia de Banderas, just 15 minutes from the more..
Condo Alvarado is contemporary decorated. Its spacious living room features a flat screen TV with a sofa-bed. The more..
Shangri-la Marina is a residential area of upscale luxury. Our condo is located beachfront pool and common area in more..
Nuevo Vallarta is considered a premier vacation destination because of it is vegetation and long beaches of more..